My brother and I are both very fond of sweet potatoes. It was no surprise that as soon as I saw No-Knead Sweet Potato Dinner Rolls from The Kitchn, I bookmarked the recipe. Like most bread baking projects, the recipe takes on a relaxing pace which requires plenty of time for the dough to work its own magic. I planned my Sunday carefully to perfectly schedule in a workout and a trip to Le Pain Quotidien while the dough rose and chilled. What started out as a simple follow-the-recipe exercise quickly took on a life of its own. When I was mixing the dough, I noticed a bag of whole wheat flour I bought last week. In it went with the all-purpose flour to add a bit of wholesome nutty taste. While I was driving to the bakery, I thought of the extra mashed sweet potato. I would be more than happy to eat it by the spoonful but what if I incorporate it into the bread like cinnamon swirl bread? My first thought was to mix it with brown sugar, cinnamon, and ginger. It seems all a bit too obvious though. Then I remember the Vanilla Mashed Sweet Potatoes from 101 Cookbooks that Heidi Swanson highly recommends. To complement the warmth of vanilla, caramel would be my first choice. I bought a bottle of fleur de sel caramel spread from famed Montreal chocolatier Geneviève Grandbois a while ago but hadn't found a good excuse to open it yet. Today was the day! I imagine dulce de leche would be a good fit too. When I got home, I couldn't wait to engage in my new course of action. I double checked I had enough dough for two loaves of bread with some quick look up and calculation. I refreshed my memory on how to shape a perfect sandwich loaf. Waiting was indeed the hardest part. My house filled with the yeasty sweet aroma of bread while the loaves were baking in the oven. It seemed like an eternity before the bread was cool enough to slice, all the while taunting me with their gorgeous good looks and irresistable frangrance. When I finally took a bite, this bread was everything I imagined it would be. The tender soft crumb tasted faintly of caramelized sweet potato (I roasted mine to the brink of burning to bring out as much flavour as possible). But the star of the show is really the swirl filling. 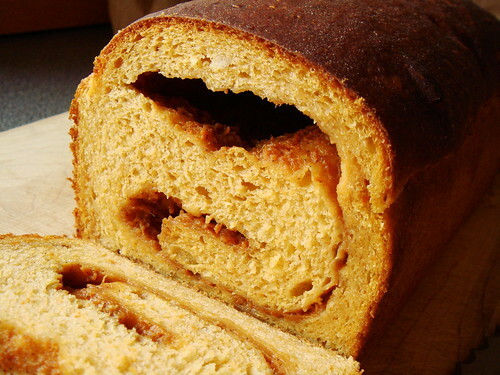 The vanilla perfumed the entire loaf of bread and the sweet potato caramel spread added just enough sweetness for a double punch of sweet potato goodness. My brother and I could hardly limit ourselves to just one slice! To make mashed sweet potato: Roast the skin-on whole sweet potatoes in a 400F oven for 45-60 minutes until knife inserts into the thickest part with no resistance. The exact baking time will depend on the size of the potatoes. Once they're cool enough to handle, peel and discard the skin. Mash them in a bowl until no lumps remain. Set aside to cool to room temperature. You can do this a day in advance and store the mashed sweet potatoes in the fridge. In a large mixing bowl, stir together warm water, yeast, and brown sugar. Let it sit for 5 minutes until bubbly (just to make sure the yeast are alive). Stir in 255g of sweet potato, warm milk, melted butter, cinnamon, ginger, and salt (add the salt last) until homogenous. Using a sturdy spatula or wooden spoon, beat in both types of flour until you have a shaggy ball. Cover with plastic wrap and set in a warm, draft-free place for about 2 hours until dough doubles in size. Chill the dough in refrigerator for 2-4 hours. To make swirl filling: measure 135g of sweet potato in a small bowl. Stir with caramel spread and pulp from vanilla bean until smooth. Set aside. Grease two 8.5x4.5 loaf pans. To shape the loaves: Divide dough in two. On a very well floured surface, gently shape the dough into a ball. Using the tips of all your fingers, dimple the dough into a rough rectangle. With a rolling pin, roll out the dough to a 7x12 inch rectangle with the short side facing you. Spread half the swirl filling onto the dough with an offset spatula, stopping just before the short side further from you. Starting from the short side closest to you, roll the dough up jelly-roll style. Brush away excess flour with a clean pastry brush as you roll. Once you get to the end, pinch to seal. You should now have a 7 inch log. The dough is very soft so try your best to move it to one of the prepared pans, seam side down. Repeat with the other half of the dough. Set the loaves in a warm moist place for about 45 minutes or until the dough rises to the rim of the pan. Believe it or not, my make-shift setup is the microwave! Put 3 cups of water into a glass container and microwave on high for 5 minutes. Put the pans inside the microwave as well and close the door. Between the heat and steam from the water and the enclosed space, it's the perfect environment for the final rise. About 20 minutes before the dough is ready, preheat oven to 450F. Bake for 35-40 minutes until top is deep brown and the bottom sounds hollow when you tap it. Unmold to a cooling rack and set the bread right side up. You can glaze the top of the loaves with melted butter for extra shine and flavour. 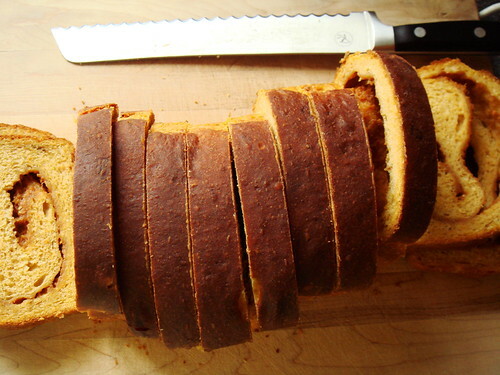 Let the bread cool down to room temperature before slicing. It hasn't been that long since I started immersing myself in homecooking. Case in point, there are many basic dishes in a homecook's repertoire that I have yet to attempt. 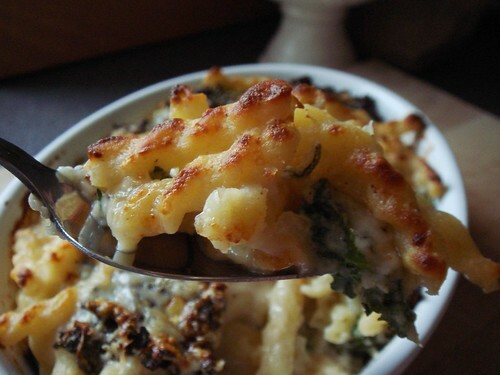 Basic dishes such as lasagna, moussaka, and macaroni & cheese immediately sprung to mind. What do they have in common? All three dishes use ﻿béchamel as a fundamental building block. Being brought up on traditional Cantonese cooking, I reach for corn starch slurry by reflex at the slightest hint of a sauce that seems a bit too thin. Cooking butter with flour to make a roux and then thin it with liquid? [shudder] That sounds like a lumpy mess waiting to happen. However, learning is as much about conquering fears as mastering techniques. I strive to be a confident homecook and that means trying unfamiliar techniques. Béchamel is not at all expensive to make. It is simply butter, flour, and milk after all. To put that sauce to use, I was not yet ready to commit to expensive ingredients and plenty of time to make lasagna nor moussaka. Mac & Cheese, on the other hand, seems like the perfect vehicle. I adapted from The Pioneer Woman's recipe and added sage, thyme, garlic, onion, and kale for some depth of flavour. If you look closely at the photo, you will notice that the pasta is in fact not macaroni, but gemelli. I'm partial to the skinny twisty shape because I think they pick up the rich cheesy sauce rather well. The star of the show? Sharp aged white cheddar of course! I used a locally made 7 year old white cheddar by Mapledale. Bring a medium pot of water to boil. You can cook the pasta according to package direction which I never do. Instead, I put salt and dried pasta to the pot of boiling water, bring it back to a boil, turn off the heat, and put the lid on the pot. The residual heat is enough to gently cook the pasta to desired consistency. I prefer the pasta a little firmer for this dish since we'll bake it later. Mine was done in close to 10 minutes. Drain and set aside. Preheat oven to 350F. 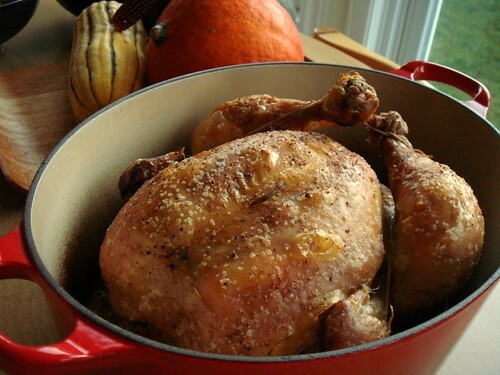 Grease a 3-cup baking dish and set it on a baking sheet. In a small saucepan, heat 1 tsp olive oil over high heat. Saute onion, garlic, thyme, and sage until softened and fragrant. Empty the vegetable to a large mixing bowl and set aside. Using the same saucepan, whisk together butter and flour briskly over medium high heat until the paste is golden and clears the bottom of the pan. Pour in milk, mustard, paprika and keep stirring over medium heat until it thickens to consistency of cream soup. Voila Béchamel! In the mean time, crack the egg into a heavy bowl. Temper the egg with a ladle of béchamel before adding it to the saucepan. Turn the heat down to low and add in grated cheese by the handful. Stir the sauce to ensure cheese is melted before adding more. Season with salt and lots of black pepper. In the large mixing bowl with the onion mixture, toss together cheese sauce, pasta, and kale until everything is evenly coated. Adjust seasoning if necessary. 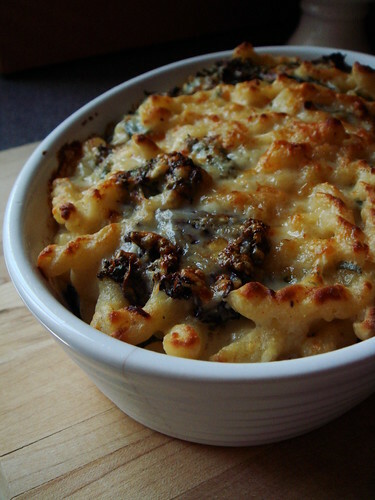 Fill the prepared baking dish with the pasta and sprinkle reserved grated cheese over the top. Bake for 15-20 minutes until bubbly. If the top is not brown at this point, switch to broiler setting and blast just long enough for the top of the casserole to be golden. Do not take your eyes away from the oven while broiling! Serve immediately. At last we've come to the fourth November recipe for this month's French Fridays with Dorie. What a great month it has been! I enjoyed much success with roast chicken, potato gratin, and pumpkin flan so I have no doubt the Caramel-Topped Semolina Cake would be wonderful as well. Yes, the end result was marvelous but the journey was not completely free of obstacles. From the get go, I was determined to make this cake in individual servings instead of the full 8" round called for in the recipe. In my head, I visualized an elegant dessert that would not look out of place at a dinner party. I dug up my precious set of timbale molds (imagine individual popover tins) and got to work. The original recipe is intended for 8 servings. Since the amount of batter yielded approximately 2 1/2 cups, dividing them among 8 timbale molds made sense without being too tall or too squat. I made the amount of caramel called for in the recipe thinking that the surface area of an 8" circle ought to be similar to 8 of my molds. Unfortunately I was wrong. I only had enough to cover four molds so I made a second batch of caramel, all the while muttering under my breath for having to clean another pot due to my poor estimate. I had a bit of trouble with baking time since mine were obviously much taller than a round cake pan would yield. The cakes were puffed but I was doubtful the centre was set after 25 minutes of baking. I lost track of the total baking time until the cakes passed the clean toothpick test. As the recipe suggested, I tried to unmold as soon as the cakes came to room temperature. I should have listened to my gut feeling and wait for them to rest in the refrigerator for 24 hours. The one that I dislodged from the mold, a third of the cake remained with the caramel. It was delicious and unusual (love the plump golden raisins) but clearly I was not happy. Recalling lessons from baking school, we always made creme caramel a day in advance because the caramel sauce would liquify during the 24 hours of chilling. This is the same reason why you never store hard caramel garnishes in the fridge because sugar attracts water and your garnish would simply sweat and melt. The bottom of the custard ought to slide out of the mold effortlessly with the added bonus of more caramel sauce. This semolina cake should be no different. When I tried to unmold the cakes again a day later, I knew my patience paid off. I followed Dorie's suggestion to serve the cakes with fresh pineapples. 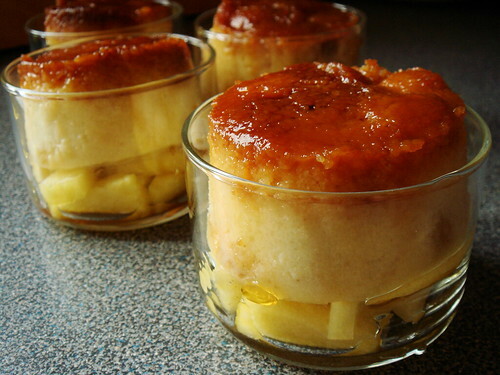 I lined the bottom of glass ramekins with small chunks of fruit and then unmolded the cakes directly on top. No need to shake, just let gravity does the work. The caramel stained the top of the cakes into a lovely mahogany hue with just a hint of bitterness (I like my caramel really dark). I broke into a satisfying smile as I watched the excess caramel dribbled gracefully to the bottom of the ramekin, saucing the sweet tart fruit. 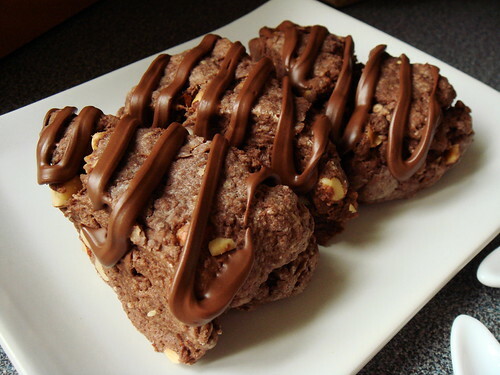 I agree that this dessert is perfect for occasions when we don't want something too heavy or decadent. Don't forget to check out what other members made this week at French Fridays with Dorie! I already celebrated Thanksgiving back in October with a very traditional feast combining family favourites such as Mushroom Pancetta Chestnut dressing and Spiced Port Apple Cranberry Sauce along with new additions like Chipotle Corn Chowder and Caramel Pumpkin Pie. The cooking was a bit involved but I thoroughly enjoyed the delicious meal shared with love ones. For anyone who pay even the tiniest attention to food media, the last three weeks have been non-stop on everything Thanksgiving related. It's difficult not to get caught up in the holiday spirit even though it's not really my celebration so to speak. However, any excuse to feasting is definitely welcomed, especially one which pies hold a place of honour on the table! Free from family obligations, for me, American Thanksgiving is a great opportunity to experiment with new dishes. I was going to prepare a vegetarian menu but last minute work demands made that infeasible. Once I have my heart set on something, it's difficult not to see it through to fruition. As a compromise (a very sweet compromise), I decided to go ahead with just one dish: Melissa Clark's Harvest Apple-Pear Pie with Cranberries and Rum Raisins. 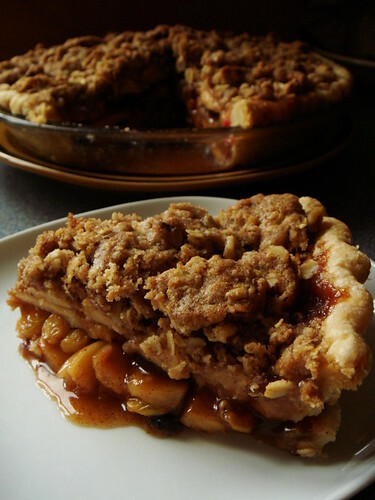 I have made plenty of double-crust apple pies and probably even more apple crumbles in all these years I spend in the kitchen. Strangely enough, I never once attempted to make apple crumb pie. It always seems like a cop out requiring less finnesse with dough handling. However, after reading Clark's introduction to the recipe in her cookbook In the Kitchen With A Good Appetite, I was smittened. Her recollection of making a pie with twenty ingredients when she was a child was charming and reminded me of my own childhood. 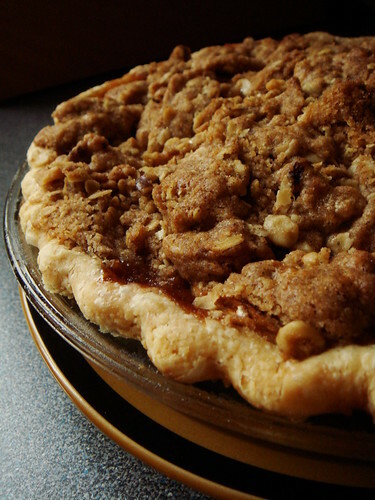 Besides, her pie sounds pretty amazing too with a fruity filling of apples, pears, cranberries, dark & golden raisins in rum, all top off with an oats and spice crumb topping. My standby pie dough is Rose Levy Beranbaum's flaky cream cheese dough. I must admit it is not a fun dough to work with despite how good it tastes. The small amount of liquid in her recipe meant that the dough is crumbly and requires careful coaxing to form a coherant dough without overworking. I am ready to try a new recipe. Clark's version is a dream to work with. It is soft, pliable, needing only minimal rest time, and 100% buttery. When I rolled out the dough, the marbling of butter was beautiful and a foreshadower of flakey crust. I swapped out the pears with more apples so I had a mix of tart Northern Spy and spicy Russet. I followed the remainder of her recipe to a T and everything worked as anticipated. I only encountered one minor hiccup when topping the half-baked pie with crumb topping. I thought the fruit would cook down significantly but that was not the case. 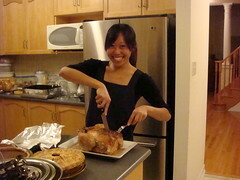 The pie was so tall that it was a precarious juggling act to place the topping on top of the fruit filling. Luckily, it all ends well and I now have a gorgeous spicy apple crumb pie. Without getting too much ahead of myself, I say bring on the Christmas baking madness! I am ready when you are. In addition to my regular blog entries, I come across many recipes that land on my to-cook list and food-related news that interest me. If you would like to check them out, you're most welcome to like the newly revamped Dessert By Candy facebook page. To receive these updates along with Dessert By Candy blog posts to appear on your Facebook feed, simply click on the Like button on the Find us on Facebook box to your left (not to be confused with the Like button at the bottom of this post...) or visit my facebook page directly and click Like. 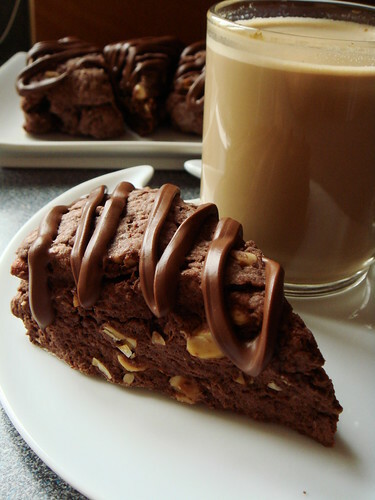 If you have recipes that I really shouldn't miss or you tried one of my recipes, I would love to hear from you too! The Pumpkin Gorgonzola Flan from Dorie Greenspan's Around My French Table is a recipe that inspires me in many ways. 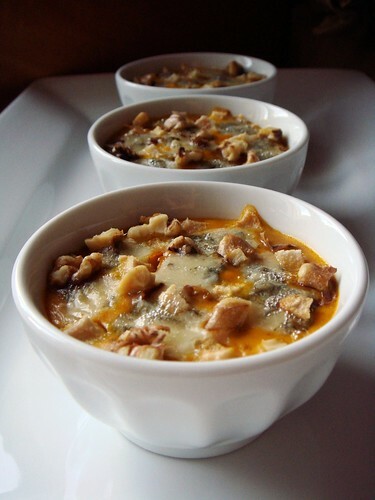 The basic recipe as written is a baked custard fortified with pumpkin puree and topped with gorgonzola and walnuts. These major components can be reinterpret in many ways. Add a pie crust and you have a quiche of unusual flavour. Soak in some cubes of stale bread and you have yourself a savory bread pudding. Or how about turning it into a stuffed french toast? The possibilities are endless. However, before taking this recipe into different directions, I'm curious if I enjoy the flavour combination of pumpkin, custard, gorgonzola, and walnuts. I put a rein on my culinary imagination and decided to stay close to the original recipe. Blue cheese is one of those ingredients that you either love it or hate it. I adore blue cheese for as long as I can remember so it is not much of a concern. However, given the delicate flavour of pumpkin custard, I decided to go with a creamy and mild gorgonzola dolce. This dish definitely veers on the rich side. 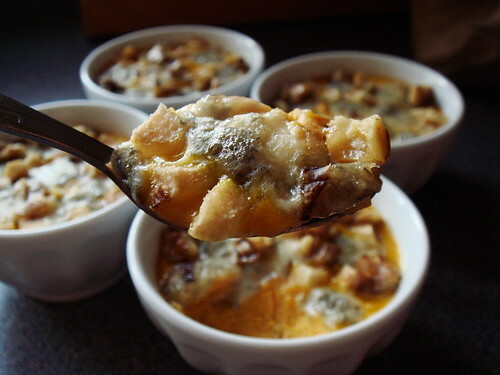 To give it a bit of fruity brightness, I threw in a handful of diced pears in addition to the cheese and nuts topping. We already have a sweet component in the form of pumpkin puree but pear is a natural partner for gorgonzola and walnuts. As it turned out, my intuition was spot on. The pumpkin custard acted as a creamy background punctuated with salty blue cheese, crunchy walnuts, and sweet juicy pears. Every spoonful was a delight. I enjoyed it equally warm out of the oven, room temperature, and even cold from the fridge. Similar to the potato gratin from a couple of weeks ago, I did not make the full recipe. I approximately halved the ingredients. You may ask what about the eggs? Well, luckily custard is pretty forgiving. I used 2 extra large eggs along with 1 extra large egg yolk. Knowing that gorgonzola is salty, I used approximately 1/4tsp of fine sea salt for seasoning. This yielded 4 half cup servings in these cute mini latte bowls. Now that I know I like this flavour combination, I cannot wait to turn this flan into quiche, bread pudding, and french toast! Don't forget to check out what other members made this week on French Fridays with Dorie! Last week we enjoyed some absolutely gorgeous autumn sunny days so it's only fair that this week we've seen nothing except for rain, fog, high wind, overcast, and cold temperature. It is a little depressing especially when I remember that days can only get shorter as we approach winter solstice. I can really use a pick-me-up. Luckily, I didn't have to look far. In fact, a rainbow has been hiding in my kitchen all along. 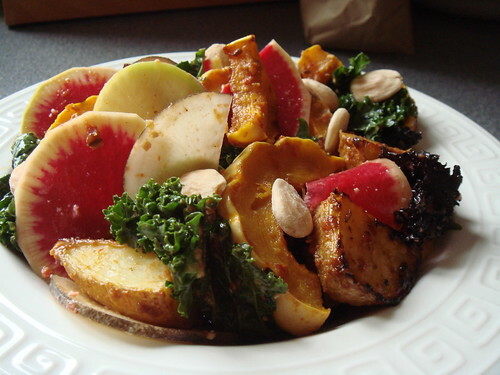 A rainbow made of roasted delicata squash, German butterball potatoes, radishes in fushia, green, & black, kale in purle & green, a smattering of crunchy Marcona almonds, all tossed in a zippy miso harissa dressing. This winning combination comes from Heidi Swanson's 101 Cookbooks. What initially drew me to this recipe was the unusual pairing of miso and harissa. These two flavourful ingredients join forces to create a savory spicy paste used for both roasting the squash and potatoes as well as dressing the raw vegetable. My miso of choice is an organic chunky white miso which is more mellow in flavour. The harissa was made from scratch from a recipe in Moro East, another wonderful cookbook. However, what I enjoy most about this winter salad is the vegetable themselves. Roasted delicata squash is sweet and starchy, reminiscent of sweet potatoes. Their scallop edge is so pretty to look at! The German butterball potatoes took on a deep caramelized colour after spending time in the oven. The three types of radishes taste subtly different. Last but not least, sturdy kale leaves offer that slight edge of bitterness to balance things out. 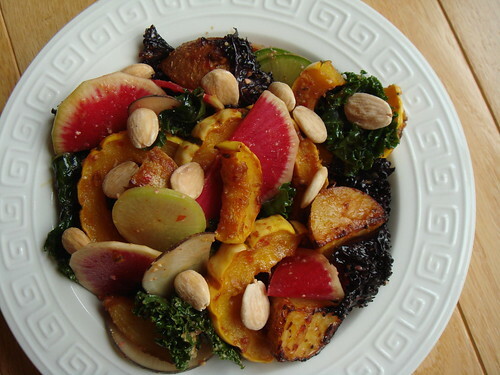 This is actually not my first attempt with Roasted Delicata Squash Salad. I already made it once back in October. However, it was far less pretty compare to the version I made last night. I eat with my eyes as much as my tastebuds. Although I can attest that both salads are equally delicious, the visual stimulation from this riotous burst of colour truly brightens up my day. I used to adore making elaborate desserts. The challenge of putting together a well thought out plated dessert or an elegant entremet was exciting. However, as I spend more time in the kitchen, I've come to develop a deep appreciation for dishes that are deceptively simple yet manage to coax every drop of flavour from the ingredients. This applies to both sweet and savory side of my cooking. 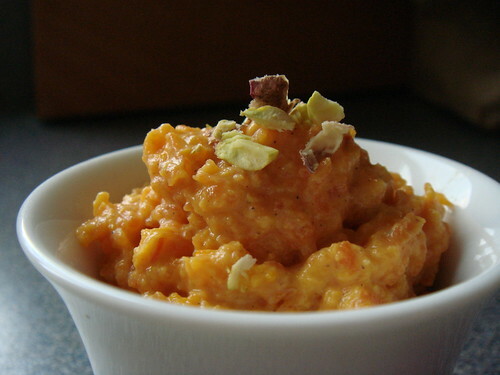 My first taste of gajar (carrot) halwa happened at my company's office party at Pune in 2005. I don't remember the exact reason for the party except that our CEO traveled to our India office so it must have been a big deal. Anyway, there was a good selection of snacks and sweets and I was intrigued by the bright orange mush. I took a bite. It was warm...it was very buttery...the sweetness is not just vegetal but also dairy...oh it was so fragrant with cardamom which I forever link with Indian cuisine. My coworkers helpfully explained to me everything about gajar halwa. In particular, the reason that it tasted so good was the copious amount of ghee (clarified butter). Of course, everyone chimed in that their mother makes the best version! According to my coworkers, gajar halwa is a Punjabi specialty. Since we have a significant Punjab population in Toronto, delicious versions can be had close to home. However, I am curious to make it in my own kitchen. Gajar halwa is perfect example of coaxing maximum flavour from a few simple ingredients. The basic premise is slow cook milk and carrots over low heat to reduce the liquid. Add sugar and ghee and continue cooking over higher heat until all liquid evaporates. Given the amount of cooking time, I decided to make a big batch as a lazy weekend afternoon project. Let me tell you, it is a labour of love! The milk took forever to reduce. In my world, anything over four hours is forever! However, when all is said and done, I am thankful for the stellar result. My first attempt with gajar halwa was rich with a milky sweetness and perfumed with cardamom and saffron. There isn't a bucket of ghee involved yet every spoonful tastes delicious with a depth achieved only by long hours of cooking. I serve tiny portions in porcelain condiment cups and garnished with a pinch of chopped pistachio. The contrast of orange and green is beautiful to look at. Recipe is available from Bon Vivant. There are still plenty of sweet carrots available in farmers' market. Give this recipe a try before they disappear from the market! 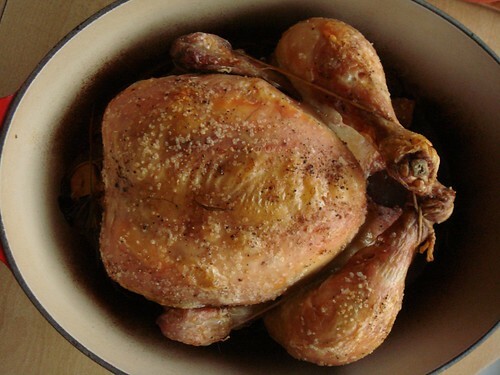 For a recipe titled "For Les Paresseux (lazy people)", this roast chicken has some expectations to live up to. Honestly, there are plenty of things that lazy people can make without expending much effort but if it is not delicious, what is the point? For all intents and purposes, it would be a waste of good ingredients. However, judging by my past experiences with Dorie Greenspan's recipes, I have enough confidence that the dish will turn out well. So I went ahead and splurged for a 4.9lb whole chicken from one of the better butcher shops in town. True to the lazy spirit, the chicken was pristine (alas, that means no giblets), trussed, and ready for some (cooking) action. I'm pleased to report that it was worth the splurge. Total active time for this recipe? 10 minutes. And I wasn't working particularly fast. Within that short amount of time, I greased the Dutch oven, lined it with bread, seasoned the chicken, arranged the aromatics, drizzled the whole thing with olive oil and Côtes du Rhône, and sent it to the oven. I used a combination of rosemary, thyme, and sage because I did not have oregano on hand. The garlic that I used was grown locally and very heady. As you can see from the picture, there was not much room in the 5qt pot to fit in root vegetable so I simply roasted the chicken for 90 minutes straight as the recipe called for. The timing was perfect. Can you see the blistered skin from the picture? Oh yes, the skin was crispy. Underneath that, the meat was juicy. That's fulfilling two key criteria for good roasted chicken. My typical approach to roast chicken involves painstakingly seperating the breast meat from the skin and massage in plenty of herbed butter. That's really too intimate for my taste so I'm doubly pleased that this recipe omits this step yet the result remains very satisfying. There is one slight disappointment though. The bread that everyone enthused, in my case, was nothing to write home about. It was greasy, pliable, and soggy with pan juice. Other than the fact that it prevented the chicken from sticking to the bottom of the Dutch oven, I felt a bit robbed of the precious pan juice that I could otherwise fashion into a nice gravy. However, what did NOT go to waste was the roasted garlic. I easily extracted the sweet cloves to flavour a roasted squash parsnip mash to serve with the chicken. Of course I took full advantage of the hot oven to roast some squash while the chicken was cooking. The frugal side of me smiled ear to ear as I found ways to make sure nothing goes to waste. Don't forget to check out what others made this week on French Fridays with Dorie!